ONEHOPE Autism Care Today for Military Families 5k/10k..
San Diego, CA. Pacific Beach - Dana Hotel on Mission Bay. This session is designed specifically for those that want to work on their pop-ups and paddling out to the outside if it is not too big. Come join us for a night of fun, dancing and music to celebrate Earth Day April 20th. We will have the rooftop open with live music and open pool. Don't forget to bring a towel. We will have Live music and dancing and fun with the pool being open for use. NOTE THAT GAME EMPIRE HAS A NEW LOCATION. San Diego, CA. Clairemont Lutheran Church - Clairemont. San Diego, CA. House of Pacific Relations - Hall of Nations, 2191 Pan Ameri..
San Diego, CA. San Diego Civic Theatre, San Diego, CA - View Tickets. Book Club: "The Artists Way"
San Diego, CA. BALBOA THEATRE - SAN DIEGO, CA. San Diego, CA. 526 Market St, San Diego, CA 92101, USA. Poetry V: Publishing—How to Give a Poetry Reading—Record..
Keeping—Your Manuscript with Ron Salisbury and Seretta Martin. 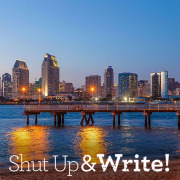 ttp:sandiegowriters.... In this..
San Diego, CA. San Diego Writers Ink, 2730 Historic Decatur Rd #202-204, Sa.. There will be a variety of local guest speakers discussing different ways to promote and support local small businesses for beginners and experts. The event will in1clude exhibitors and entertainment. San Diego, CA. The Westgate Hotel. San Diego Vintage Sci-Fi presents: TALES FROM THE BLACK LAGOON! TALES FROM THE BLACK LAGOON! This time, we are meeting at Nobel dog park in La Jolla. It's Easter weekend so feel free to dress your poms up as bunnies. See you all there. San Diego, CA. San Diego Civic Theatre. San Diego, CA. Sprint - Olympic - San Diego - CA. San Diego, CA. Pali Wine Co.
San Diego, CA. Petco Park.